What is that? Is it a big dolphin? That dorsal fin is shaped kinda funny… Is it all black? Did it just jump out of the water? These are just a few of the exciting questions that guests onboard Marietta as well as at Birch Aquarium were asking in the last few weeks. 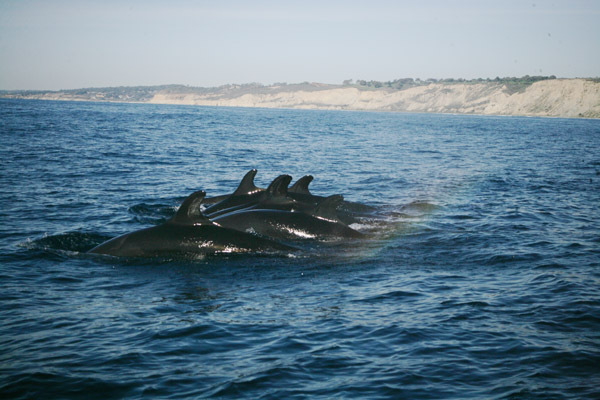 The warmer than usual waters have brought some uncommon visitors into San Diego’s waters and we have been lucky enough to have some pretty spectacular experiences! First, visitors got to see more than sea stars while visiting Tide-Pool Plaza at Birch Aquarium. 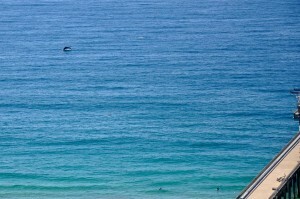 From this high vantage point, visitors and staff were delighted to see False Killer Whales jumping out of the water just off of Scripps Pier. 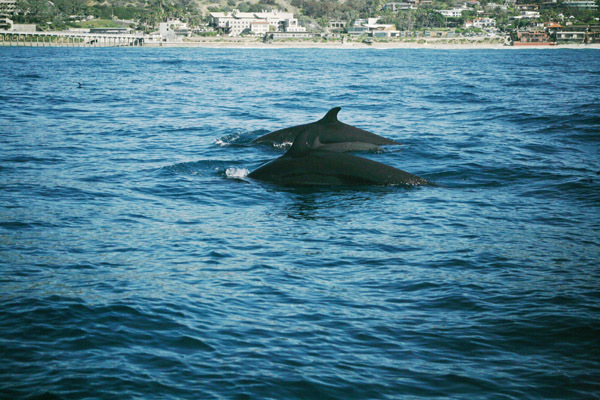 Visitors at Tide-Pool Plaza were able to see False Killer whales jump out of the water near Scripps Pier. 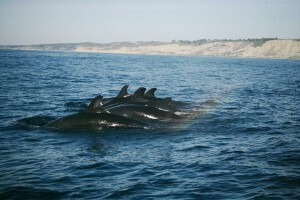 Dr. Susan Chivers, of Southwest Fisheries Science Center, told Scripps Institution of Oceanography and Birch Aquarium, “the False Killer Whales’ presence off La Jolla is likely due to the warmer than usual ocean temperatures we’re experiencing, and they likely followed their prey here.” False Killer Whales usually feed on fish and cephalopods (squid). They are fast and agile predators that often work together to take Mahi Mahi, Yellowfin Tuna, and other large fish as prey. “The waves were rolling and the sun was shining in blue skies as we headed farther off the coast. We had just left a pod of about 60 Common Dolphins when we heard a voice over the radio say they had sighted a group of whales a couple miles from us. As we got closer we could see black dorsal fins, shaped as half crescents, breaking the surface of the water. We could count about 10 from afar, but as we got closer, we realized there must have been at least 30 whales! That closer look helped us realized we had stumbled upon a pod of Pilot Whales. 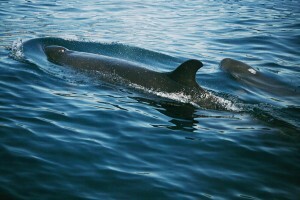 Pilot Whales have uniquely round heads and almost jet black bodies, which helped us to identify this species. The volunteers, the Captain, and I had never seen these animals in the wild! 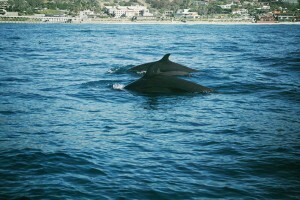 With excitement, we watched them swim gracefully slow, seeming to move through the water with amazing ease and serenity. As we watched, we could hear the force of their blows as they breathed at the surface. 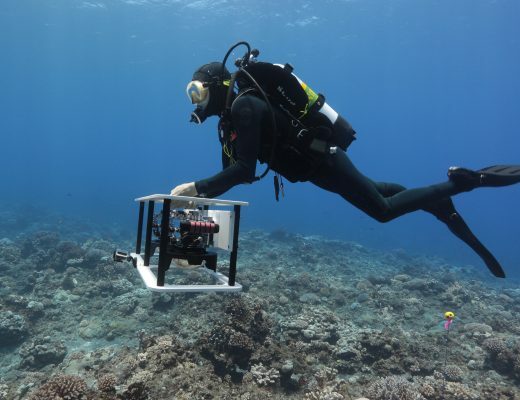 They would all dive near the same time and later emerge to breathe, some together and some intermittently. There are still a few weeks left of whale watching season, and we can’t wait to see what turns up next!